Every summer we are visited by a snake or two or three. Copperheads meet an instant death, of course, although I've only seen three of them in the decade-plus that we've lived here. If I meet a black snake, also called a rat snake, in the pasture or on the road, I walk away and leave it alone. I know they are "good" snakes - if any snake can be called a good snake, it seems like an oxymoron to me - because they keep down the rodent population. But if I find that snake in my chicken coop, it has to go. 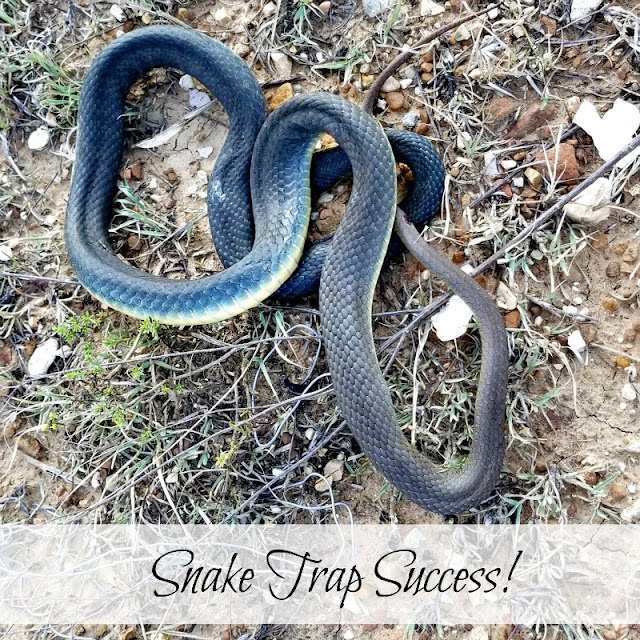 Black snakes seem to come back to the coop every couple of days and eat up all the eggs that have been laid that day. Sometimes I find them sleeping off a meal in the corner, and sometimes those black snakes are six feet long. ::Shudder:: They either have to be relocated far away (umm, I don't want to be in a vehicle with a snake OR move my problem to someone else's homestead) or be done away with. Usually hubby does the deed, and there's a hole in the coop wall to prove it. (So glad I'm not the one who shot a hole in the wall.) But when he's not home, I've had to deal with the situation. I caught the first one in a five-gallon bucket, and I chopped the head off of two more with pruning loppers. Yes, I'm pretty vicious when something threatens my birds. I did finally graduate to shooting said snakes. For several weeks now I've suspected we have a snake: the duck hens have been laying eggs but they disappear almost as fast as they are laid. Whatever it is can get through the 2x4" openings in the fencing, so it's probably either a snake or a rat, but I never laid eyes on it. I've had this "snake trap" in the chicken coop for several years. 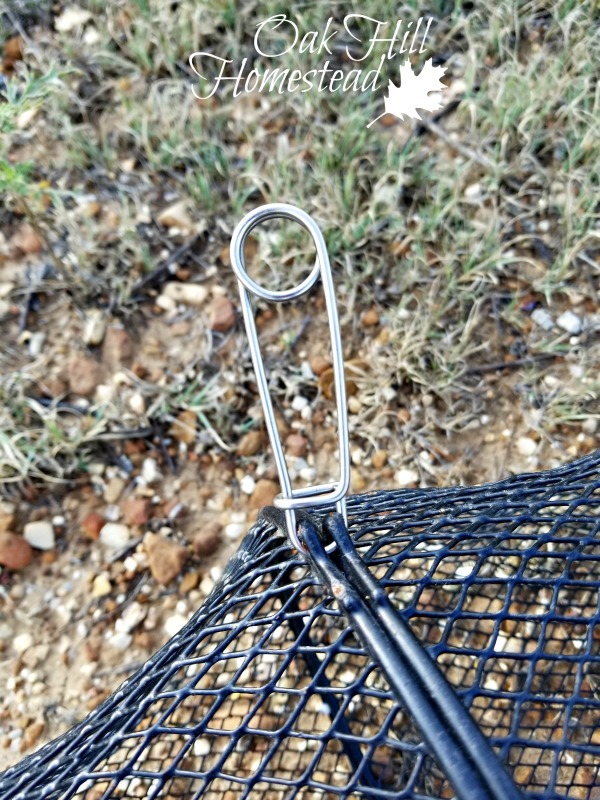 I can't take credit for the idea; I read about it online somewhere and immediately got one of my own, but up until now the only thing I've caught was a frog while the trap was in storage this past spring. Hubby suggested I move it to a new location this summer, since I wasn't catching anything anyway. It's simply a crawfish/minnow trap from the sporting goods section at Wal-Mart. (Amazon has several models; this is what they look like.) I baited it with an egg, closed it back up with the safety-pin-like clasp and set it outside the door of the duck coop. 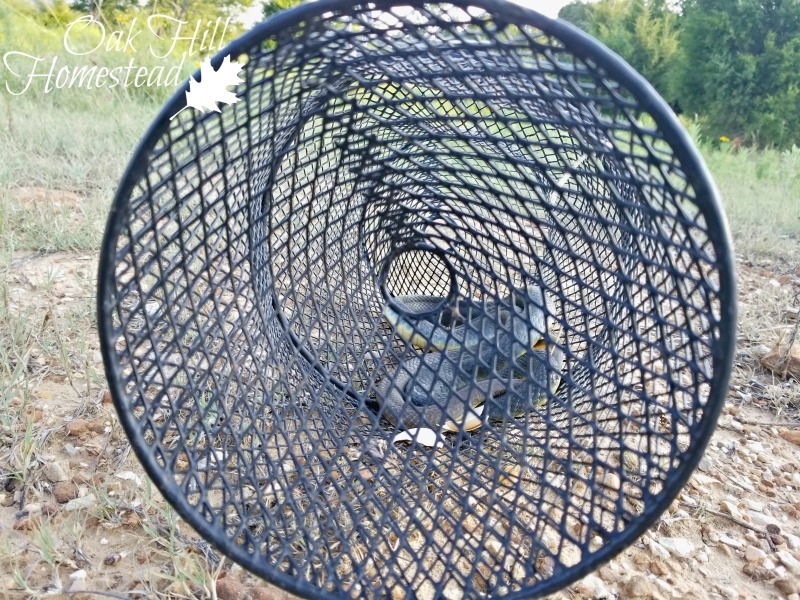 And while it was inexpensive at about $10, I didn't want it to "walk away" with a raccoon or other four-legged thief that wanted to take the trap home and work on getting that egg out in leisure, so I tied the trap to the coop fencing with hay twine. The theory is that the snake can go in through the hole, eat the egg and then not be able to get back out because it's too fat. The snake goes in and can't find the exit just like a crawfish can't. This one perished inside the trap. 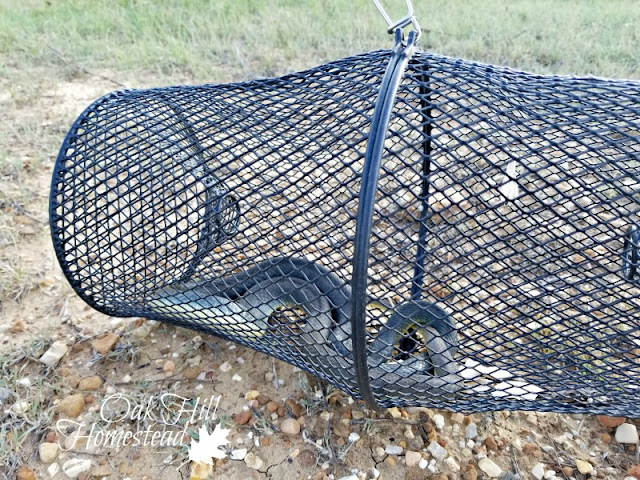 Fortunately it was dead when I found it, so I just opened the trap and dumped the snake in a clearing where a bird could find it. Hawks, crows and vultures love snakes and I'm sure it wasn't long before it became dinner. Hopefully this is the snake that's been eating duck eggs. But just in case, the trap is baited and set again. Where there's one snake there are often two. I'm shuddering with you! Glad you caught one, and glad you didn't need to "take care of it." Yikes! You are brave! We had a rat snake follow a mouse into our house and my husband found it in a trap he'd set in the space beneath our bath tub where the mice were coming in. What a shock. Of course I wouldn't let him show it to me. LOL! I'll pass the snake catching info on to him. I'm not really brave, it's a case of "do what you gotta do." I'm sorry you had one IN YOUR HOUSE, Patricia. After we moved to Missouri, I heard our geese honking up a storm. I went out to see what the problem was and there were two 6ft. black snakes trying to get the goose eggs. I got a 10 ft. wood pole and starting trying to get those snakes away from the eggs. (For some reason, husbands are never around when you REALLY need them.) I never realized how HEAVY a 6 ft. black snake is. I guess the snakes got tired of the poking, jabbing and prodding of my stick because they finally decided to go back to where ever they came from. I had seen black snakes in the chicken coop, but luckily never stuck my hand under a hen to find a snake there. I'm SURE I would have literally had a heart attack on the spot. I have to say I tolerate them much better than I did years ago. But NOT the copperheads and rattlesnakes. We did kill one copperhead that was intent on going in our barn after our goats had kidded. Wow, I'm glad they got tired of being harassed and left, Kris!